Real-time data provides users with the most current air quality results and access to HAMN’s Network data base. Several reports menus are available to summarize hourly, daily and monthly data. Statistical reports are also provided to carry out data analysis. 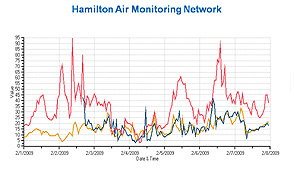 The air quality readings on this web site are automatically polled from HAMN's Source Emissions Air Monitoring Network and are intended for public awareness. The data have not undergone complete quality control and quality assurance procedures which may result in incorrect air quality readings. The air quality readings on this web site are considered “unverified data” and should not be used in published documents. Data integrity and validity may be affected by instrument malfunction, telemetry connectivity, QA/QC requirements, automatic instrument calibration sequences or power outages. All data reported in Daylight Saving Time.